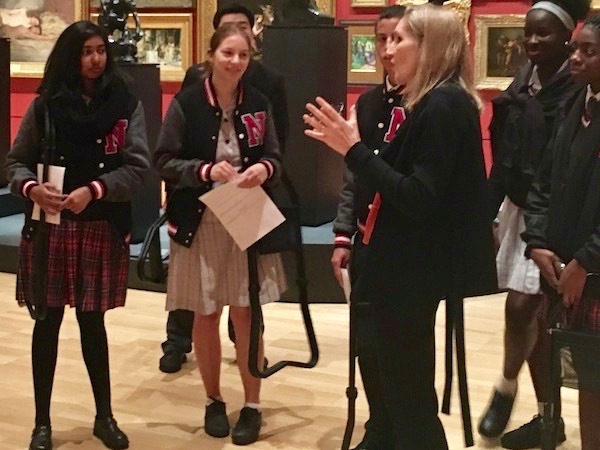 On Wednesday, 19th April the VCE Unit 1 and 3 Studio Arts students from Northside Christian College had the opportunity to have a private guided tour through the permanent collection of the National Gallery of Victoria. The class were led through the complexities involved in curating an exhibition, designing an exhibition space and preservation practices. Following this tour, students were inspired by the very best of 2017 VCE Studio Arts, at the annual Top Arts exhibition. This exhibition comprises of work selected from applicants across Victoria. The exhibition encompasses a range of media, including drawing, painting, printmaking, sculpture, digital and mixed media. Students also delved deeper into their studies with a student folio viewing and VCE Studio Arts lecture. Top Arts is part of the VCE Season of Excellence managed by Victorian Curriculum and Assessment Authority. The VCE Season of Excellence comprises twelve concerts (Top Class and Top Acts), two exhibitions, (Top Arts and Top Designs) and eighteen screenings of short films (TopScreen). All work is produced by outstanding VCE students who completed technology, design, visual or performing arts studies in 2017. Events are presented in Melbourne’s major cultural venues, and a number of associated education programs are offered in conjunction with Season events. Top Arts will be displayed from the 23rd March –15th July 2018 at the National Gallery of Victoria.